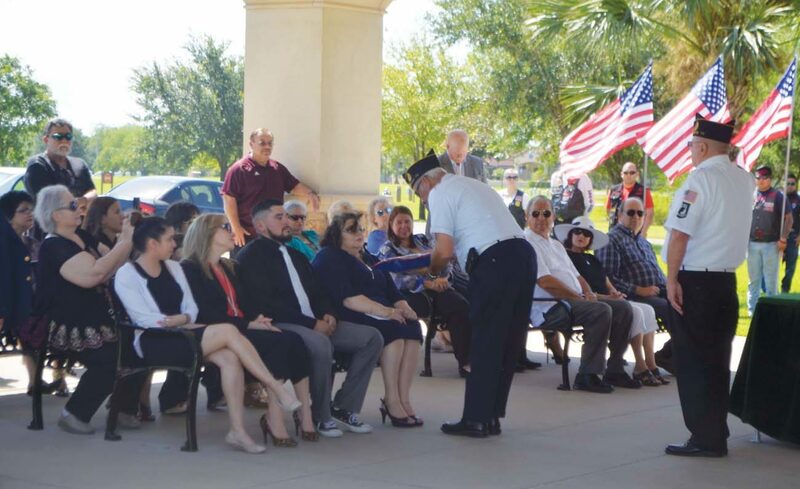 MISSION, Texas (CNS) — When 66-year-old Army veteran Jacky Eugene Gonzalez was laid to rest at the Rio Grande Valley State Veterans Cemetery June 22, a group of U.S. military veterans from the Jesus Martinez American Legion Post 93 in Mission performed full military honors. A squad of seven riflemen rendered the 21-gun salute, the American flag was folded and presented to the family along with three spent shell casings representing duty, honor and country. Taps was played on an electronic bugle. The men, who are all volunteers, are in their 60s, 70s and 80s. They perform these solemn duties several times a week, usually at the veterans cemetery, but they will go wherever they are needed. Guard members have served at up to four funerals in one day, often in temperatures hovering around 100 degrees. Regardless of the weather conditions, no matter what aches and pains they are experiencing, they don’t see it as a burden but rather, a great honor. “I don’t think anyone sees this as a sacrifice,” said Army veteran Juan Angel Longoria, who also is a parishioner of Our Lady of Guadalupe Church in Mission and a member of the Catholic War Veterans Post 1065. “For us, it’s no big deal. For Flores and the other men of faith in the honor guard, there is a personal spiritual component to what they do. The vast majority of the time, the men have never met the veteran they are honoring, but they still see him or her as family. For the men, the most difficult funerals are the ones for homeless veterans. “At those funerals, it’s usually only the honor guard and the funeral home staff in attendance,” Flores said. “After we fold the burial flag, we give it to the funeral home. They try to locate the next of kin and send the flag to them. The honor guard from Post 93 organized in 1987, has about 20 active members. About 15 guard members serve at each funeral, depending on how many are available to attend. Flores said the post is always looking for younger veterans to join. “We pray that when God calls us home, someone will be here to do this for us,” he said. Ybarra is assistant editor of The Valley Catholic, newspaper of the Diocese of Brownsville.